Open and Clothed : Case closed, you need this book! | Beauty Valued – color works! Open and Clothed : Case closed, you need this book! I reflected. I only knew clothing sounds I disliked (velcro! high heels!). Then I realized I loved the sound of beaded garments where the beads are free to sway with movement, as in two of my Halloween costumes from the past. Yet I’d never thought to look for that experience in pieces I’d wear more often. Yes, this would do nicely! To wear with my strapless top and dress! What other delights have I been missing from my wardrobe?, I wondered, How else can I understand the beauty? I cannot even begin to find a photograph to illustrate that…but you can see why i bought the book! 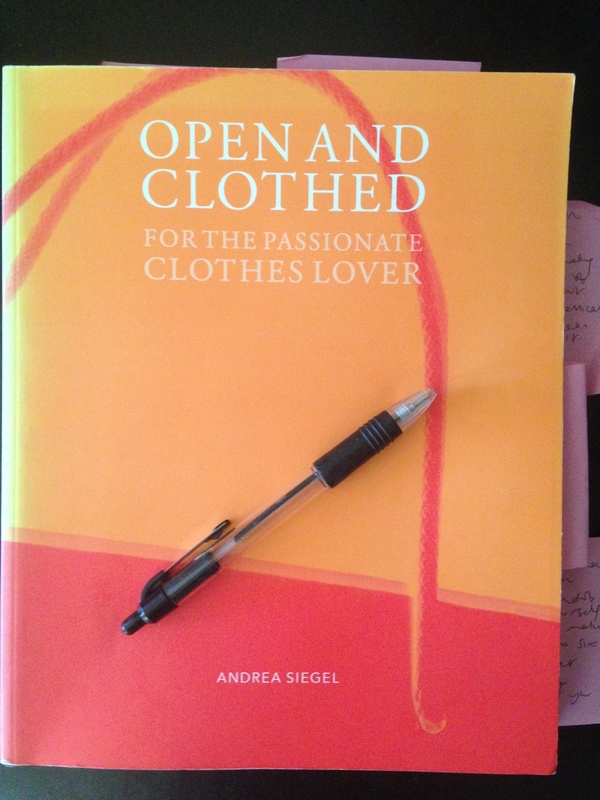 It’s called Open and Clothed (Amazon link) and it’s written by Andrea Siegel. I thought I was up on eco-fashion but I learned about naturally colored cotton from her book. The cotton grows colored and is boiled to further intensify the color. Washing the cotton later also causes brightening of it! Imagine: naturally brightening clothes! However, it is the many anecdotes offering different mindsets, the deeper questions posed and writing exercises suggested that will cause me to revisit this book time and time again. In particular, the book will help me with “stuck” clients: Clients that are scared to go try on clothes or scared to scared to buy them. Clients that hoard or shop compulsively. Clients that never feel beautiful. (And of course if you relate to any of those, get this book for yourself!) If my client is armed with color and style information, has time and money to shop and they’re not enjoying clothing more, then I want a better understanding of why. Magical powers exist for us all in varying degrees. And, magical powers may grow stronger with age. All photos link to their source. They are not in the book. “I’ve always been interested in joy,” she says. This hit home. Yes, of course. In her chapter Body Acceptance she writes: “The portion of this book is to help you escape the obsessive rut of feeling fat or yearning to be thin. Learn an alternative: feeling alive and good in your own skin. The goal is not “burning away fat”; the goal is uncovering your essence.” “OOooooh,” I can hear you say. “Mmmmmmm,” you hear me reply. It’s all about our essence. Even the reason to exercise. Essence and joy. Essence and joy. Essence and joy. What a winning combination, even if it takes some exploration to be found. Andrea’s masters thesis was about the Social History of Discount Shopping(!). She taught Textiles and Fashion Buying at a college level and added, “I really should not have been teaching Fashion Buying simply because that isn’t an area of expertise, but when they said, “Teach it or else,” I chose to teach it.” How can you not LOVE this woman?!? In addition, to teaching and curating, she continues to write. She’s on books number 4 and 5 now. One is a romantic comedy destined for Broadway or Hollywood (in my opinion) and the other is a nonfiction book to help children afraid of water learn to swim. I’m ready to buy both. I admire her Renaissance woman approach to doing it all. Did I mention she is also a lifeguard? A bit more about Open and Clothed: There is a chapter called Help! My Body Keeps Changing! (Told you she was practical.) My favorite chapter is What Makes You Feel Beautiful? because the answers have much less to do with clothes than you’d think. This is not a how-to-get-dressed book, though her work would help those torn between different advice and get newbies off to the most interesting start. This is a how-to-rethink-getting-dressed book. It is funny, it is serious, it is historical, it is current, it is sad in places and bizarre in others, but mostly, I am writing this because it is eye-opening. if you’ve enjoyed this book review with words from the author, check out my post about Joan Callaway, and her book The Color Connection, here and also my post about mother daughter team Arielle and Joanne Eckstut and their book the The Secret Language of Color, here. The only list of ten items I think every woman should own is here. I think Andrea would approve, with exceptions made for those performing acts of magic. If you’d like a signed new but but slightly discolored with age copy of her book (isn’t it comforting that books age too?) or want to thank Andrea for helping us think outside the box, you can email her at ASiegel@hccc.edu. Note: she only checks this email every few days AND (see comment following) she insists we buy copies we can find online cheaply first (and a bouquet of flowers with what’s left over!). If copies online sell out she has more for $24 plus shipping. This entry was posted in Book Review on March 18, 2014 by beautyvalued. All right. You had me at the first quote. I rushed straight to amazon.com and bought the book! Thank you so much for this book review! Good, good! Can’t wait to discuss it further! Haha. You know, I think there are companies that lend clothes beyond formal wear! Enjoy! Your review reeled me right in, Kathy! I ordered the book and am looking forward to discussing it. I’ve sent a request to the author. I expect your signed copy to become a collector’s item some day. Take good care of it! I am intrigued! May have to look for this on Amazon. Thank you Kathy for finding it. If you can’t find it on the UK site, look on ebay. Or second hand vendors on american sites that ship overseas. Well worth it! Thanks for commenting! Aw, nice words, Andrea! I told them in the Slow Fashion group that you even thanked those who make post consumer waste recycled paper products in your acknowledgements! We all do need flowers, don’t we? Yes! Glad you’re getting it! And thank you, Sandy!